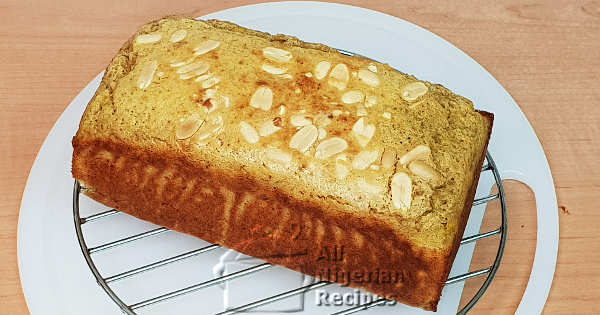 Plantain Bread is another yummy recipe you can use those overripe plantains for. It's great for breakfast, washed down with hot chocolate. The quantities of ingredients listed below are what I used for medium loaf of plantain bread. An oven with a top and down heating capability is best. Or a big pot. See the video below. Use overripe plantains but not rotten ones. See what I mean in the video below. The eggs should be at room temperature. Which means that before you make the plantain bread, bring the eggs out of the fridge long before you will make the cake. If it is winter where you live, bring them out the night before. Baking soda is not the same as baking powder. You can buy baking soda where they sell baking powder. Pour the evaporated milk in a cup and warm it up a little bit, about 30 seconds in the microwave oven. Peel and mash the plantains either with a fork or with a potato masher till as smooth as possible. Set aside. Whisk the eggs and set aside. In a dry bowl, mix the flour, cinnamon, brown sugar, salt and baking soda. Add the milk and yeast mixture, the melted butter and the mashed plantains and mix. Add half of the roasted grounduts (peanuts), crushing it by hand as you add. Mix very well. Pour into a bread pan and sprinkle the remaining groundnuts on top. Bake in a preheated oven at 180 deg Celsius (350F) for 40 minutes. You can also use a pot to bake this if you don't have an oven. See the video below for a demo. The plantain bread is done when a wooden skewer inserted into the bread comes out clean. The bread also springs back when you press it down. Lay on the rack till it has cooled down to a comfortable temperature.